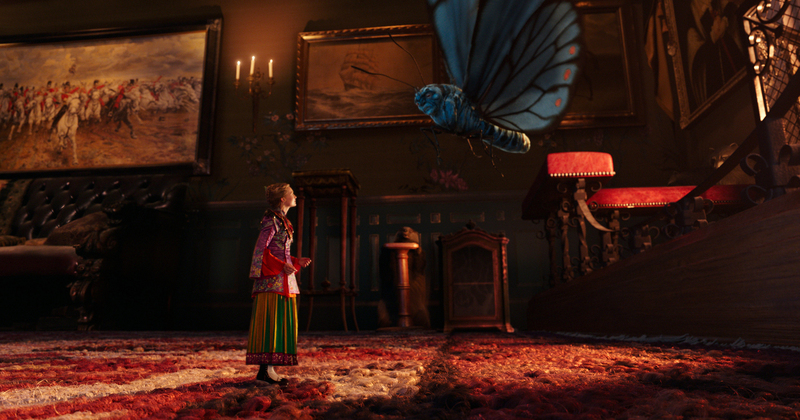 ‘You’ve been gone too long, Alice,’ states the wise, all-knowing caterpillar-turned-butterfly Absolem, voiced by the late, great Alan Rickman (to whom this film is dedicated). And I couldn’t agree more. When Tim Burton’s 2010 live-action Alice in Wonderland adaptation generated over one billion dollars in ticket sales (worldwide) for Walt Disney Pictures, subsequently becoming Burton’s most successful film to date, a sequel was inevitably in the works — but why the wait? Having been six years since the Johnny Depp-starring vehicle made a pretty penny at the box office, some of the superstar’s charisma has (now) seemingly fizzled, along with the ingenuity of the original movie, which was praised for its visual bedazzlement and cutting-edge computer-generated imagery, though criticized for being ‘joyless’ and having a serious lack of narrative heft. Life’s short. Just ask a butterfly. 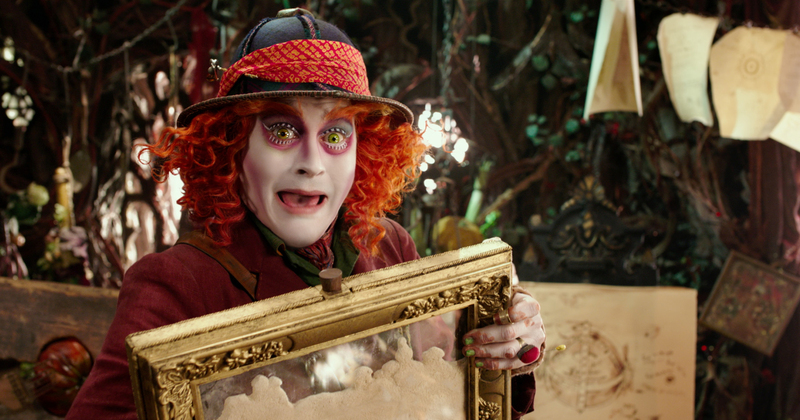 Thankfully, Alice Through the Looking Glass doesn’t suffer from this extensive hold-up, Alice Kingsleigh’s hallucinogenic ‘trip’ being wilder and loonier this second time over, loaded with even more bountiful imagination than its off-the-wall predecessor. A Burtonesque sensory overload, this follow-up is beautiful, frivolous and haunting, working as both a prequel and sequel to the 2010 film with a frenzied story (zigzagging back-and-fourth through time) that’s charming, witty and above all, highly entertaining — it’s just a shame we weren’t whisked back to Wonderland sooner. Inspired by Lewis Carroll’s 1871 book Through the Looking-Glass, and What Alice Found There — a continuation of Alice’s Adventures in Wonderland, written in 1865 — this latest fantasy adventure has very little to do with Carroll’s masterwork outside of borrowing its title and a handful of key characters, abandoning the episodic nature of its source material. Opening up on the high seas, we’re re-introduced to the titular Alice (Mia Wasikowska) as a valiant and capable sea commander, following in her father’s footsteps and captaining his ship (which just so happens to be named The Wonder). However, when Alice returns to London from her three-year oceanic trade voyage to Asia, she quickly discovers that she’s facing foreclosure on her vessel unless she takes on a menial job for Hamish Ascot (Leo Bill), the snotty brat whose marriage proposal Alice previously rejected (in the former film), this all part of some desperate deal-making done by her mother, Helen (Lindsay Duncan), to keep the Kingsleigh estate. But before Alice can make her final decision, she’s swiftly whizzed to Wonderland (or Underland) through a magic mirror, aka a ‘looking glass.’ There, she learns that her truest friend, the Hatter (Johnny Depp) — who’s beginning to lose his ‘muchness’ — is seemingly off-color, this Hightopp torn and tormented by events of the past, desperate to locate the whereabouts of his deceased kin (who are presumed dead, killed by the Jabberwocky some years earlier) — though the Hatter believes that his family is still very much alive. With a view to prevent the heartbreaking demise of her closest companion, our quick-witted Victorian heroine turns to Time himself (Sacha Baron Cohen) for aid — or the personification of Time — a semi-mechanical (part man, part clock) grim reaper of sorts who resides in the unwelcoming fortress of eternity (which, from above, is shaped as a timepiece). Ignoring Time’s desperate pleas — having claimed that events ‘come and gone’ are incapable of being altered or changed — Alice commandeers the Chronosphere (a gyroscopic time-jumping device) traveling to ‘what came before,’ our leading lady determined to save the orange-haired loon’s future (by locating his fam-bam) before it’s too late — Time, who’s not on Alice’s side, hot on her heels every step of the way. Making matters worse, the banished bobbleheaded Red Queen (Helena Bonham Carter) is also lusting after the time-bending thingamajig with plans to rewrite history in order to satisfy her own deep-seeded desires. But unless the misplaced Chronosphere (a gizmo that controls the indefinite continued progress of existence within the realm, now a ticking time-bomb) is returned to its resting place, Underland’s own time may very well be up. Penned by Linda Woolverton — who also wrote the screenplay to Burton’s 2010 Alice — this femme-centric fairytale cleverly weaves in-and-out of Underland’s nutty timeline as Alice scampers from one hypnotic vista to the next, in a near-impossible race against Time. 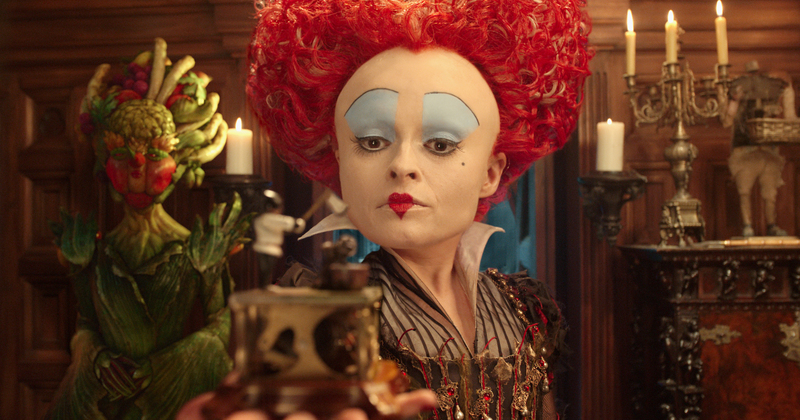 Audiences witness the roots behind the sibling rivalry that now separates the pasty White Queen Mirana (played airy-fairily by Anne Hathaway) from her older sister Iracebeth, the Queen of Hearts, resulting in an origin type yarn of how the said queen grew into her Pop-Vinyl-like head, Helena Bonham Carter playing the villainess like an emotionally damaged child who masks her hurt with bratty malevolence. Viewers are also treated to the Hatter’s forlorn backstory — where we meet his stern ‘tough-love’ father, Zanik Hightopp (Rhys Ifans) — with Depp infusing the (otherwise) eccentric Hatter with a real sense of vulnerability and regret. But taking center stage, and giving possibly one of the best performances of his career, is Sacha Baron Cohen, Hugo (2011), who embodies Time, the 44-year-old funnyman imbuing the keeper of the clock with humor and cheek, perhaps channeling his inner Christoph Waltz; a scene in which the temporal ruler is teased with some time-based wordplay is a chucklesome showstopper — this a tip of the hat to Carrol, particularly the way in which the 18th Century author frivolously twisted his words, often giving them double, even triple meanings. And accompanying this walking-talking timekeeper are his clanging minions, Seconds — whom, when prompted, ‘transform’ into Minutes then Hours — these steampunk styled muppetoids led by the mustached manservant, Wilkins (voiced by Matt Vogel). Mia Wasikowska, Jane Eyre (2011), once again makes for a ‘curious’ Alice, physically and expressively embodying all aspects the role, this nineteen-year-old convention breaker going on her own hero’s journey whilst re-discovering the mantra she’d previously adopted, believing that ‘nothing is impossible,’ which she’d begun to lose faith in out in the big bad real world. It’s a quest that brings with it earnest messages about cherishing family and friends while endeavoring to teach youngsters the importance of learning to live with (and coming to terms with) mistakes of the past, rather than simply running away from them. Also joining Alice on this madcap trek across the ages are returning characters (along with their respective voice talents), Tweedledee and Tweedledum (Matt Lucas), the grinning Cheshire Cat (Stephen Fry), Nivens McTwisp, aka the White Rabbit (Michael Sheen), Bayard the Bloodhound (Timothy Spall), the milk-white Dormouse Mallymkun (Barbara Windsor), and let’s not forget Thackery Earwicket, the raving March Hare (Paul Whitehouse) — now this bunny’s totally bonkers! Complementing the inspired, highly loaded narrative are the rich gaudy visuals: each frame is prettified by costume designer Colleen Atwood’s exuberant outfits — Attwood being a regular collaborator of Burton’s — and the (often) inky yet fiercely dazzling cinematography of Stuart Dryburgh, The Secret Life of Walter Mitty (2013). And when proceedings tend to be on the wishy-washy side — albeit, these flat spots are few and far between — there’s always the extravagant production design of Dan Hennah, The Hobbit: An Unexpected Journey (2012), and the whiz-bang VFX (which bring this breathtaking make-believe world to life) supplying some easy eye-candy whilst simultaneously showcasing the sheer talent of the behind-the-scenes crew. Helming the shiny, candy-covered epic is director James Bobin, The Muppets (2011), the British filmmaker balancing the whimsy with the weighty, extending on the vast and lavish dreamscape engineered by Burton some years earlier (who now serves as a producer on the film). Standout moments include, our heroes’ raid on Iracebeth’s stronghold, a heart-shaped keep made up of twisted vegetation and populated by hordes of luminous creepy crawlies, along with the Queen’s imposing vegetable footmen, whereas the wild and roaring sea of memories jumps out as the most picturesque, yet chaotically charged means of stepping back (or forward) in time. Although missing that child-friendly allure of its significantly lighter precursor, Alice Through the Looking Glass gorgeously sews the fates of these timeless characters into a neatly woven tapestry of awe and (well) wonder. And what we’re left with is a film with a real beating heart, Bobins fashioning a grand spectacle of fantastical proportions, a vision unlike anything presented on screen before. My only concern here — I fear that Alice Through the Looking Glass (with its rather close-ended finale) may very well be our last visit down this resplendent rabbit hole. Crowned with singer-songwriter P!nk’s ‘Just Like Fire,’ which plays over a vintage pop-up styled storybook credit sequence, Alice’s return couldn’t be any more splendiferous — alas, P!nk’s rendition of Jefferson Airplane’s ‘White Rabbit’ (used for the movie’s marketing campaign) is sadly no where to be heard (sigh). So in closing, dare I say — curiouser and curiouser! 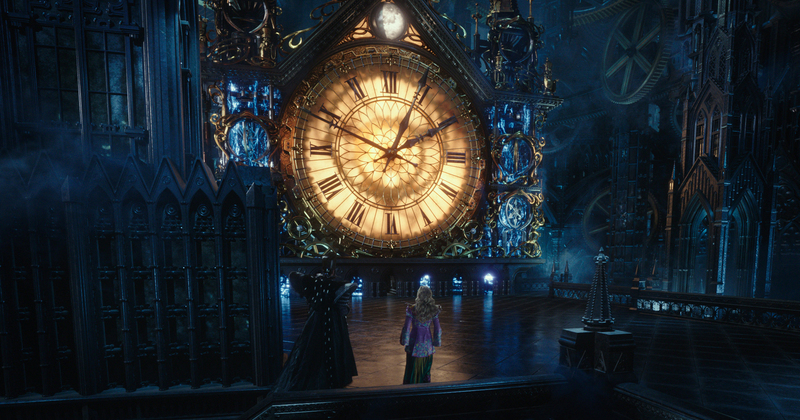 — Alice Through the Looking Glass is even better than its forerunner, a rarity in contemporary Hollywood. So ‘feed your head’ and don’t be late as this is one tea party you won’t want to miss!